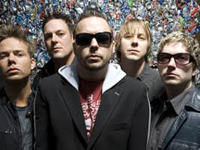 The Texas quintet Blue October came together in the late ’90s with vocalist/guitarist Justin Furstenfeld, drummer Jeremy Furstenfeld, violinist Ryan Delahoussaye, bassist Matt Noveskey, and lead guitarist Brant Coulter. In 1998, Blue October independently released their debut album, The Answers. The band’s catchy modern alternative rock led to 5,000 copies sold in their native Houston alone. Two years later, Blue October made their major-label debut on Universal with Consent to Treatment.